Take steps to ensure all that sparkles is protected. Tips for keeping your jewelry safe. - Scarsdale Premier Insurance Agency | Advocate Brokerage Corp.
Take steps to ensure all that sparkles is protected. Tips for keeping your jewelry safe. The holiday season is underway and bringing with it tons of celebrations on the calendar, a list of gifts to purchase and the anticipation of gifts you have yet to receive. As you plan your wardrobe for the upcoming celebrations, there may be special pieces of jewelry in your collection that will add some sparkle to your look. If you have special pieces of jewelry that you plan on wearing during the season, we would like to offer some advice to keep your valuables safe. Where you place your valuable jewelry items can make a big difference in keeping your collection safe. When you return home from an event, many people simply place their beloved items in a box, in a pretty dish on the dressing table or inside a dresser drawer; unfortunately this is the first place someone would look if they enter your home with the intent to rob you. Even cleverly disguised boxes, cans or rocks that are sold specifically to keep your valuables safe are not the best place for you to keep your jewelry. For items you plan to wear more frequently during the holiday season, it is best to keep it stored in a wall safe with a combination and that you place them there upon your return from the event. In fact, storing your jewelry in a UL rated home safe can result in substantial discounts on your insurance policies! However, you need to be sure that this type of safe is bolted down to the floor. The weight of the safe often gives homeowners a false sense of security because they assume it cannot be stolen but that is incorrect. We see frequent claims for a heavy safe being dragged out of the home causing damage to floors and walls along the way. So if you plan on keeping jewelry stored in your home you need to be sure it is either in a wall safe or in a UL rated home safe that is bolted to the floor! We recommend the same for jewelry that you might wear on a regular basis. Or, keep special pieces in a safe deposit box at a bank and only take them out for special occasions. If you are planning a holiday trip and your jewelry will be traveling with you, we would like to give you some advice to keep your treasures safe while you are on the road. While you may think your hotel room safe is adequate protection, we advise that any jewelry of considerable value be locked in the hotel’s safe. Check with the front desk for details. You are usually required to sign your valuables in and out. When they are not in the hotel safe, be sure to keep them with you. Are you dreaming of giving (or getting) a gift that sparkles this holiday season? Is so, you are in luck, your gift is sure to be well received! 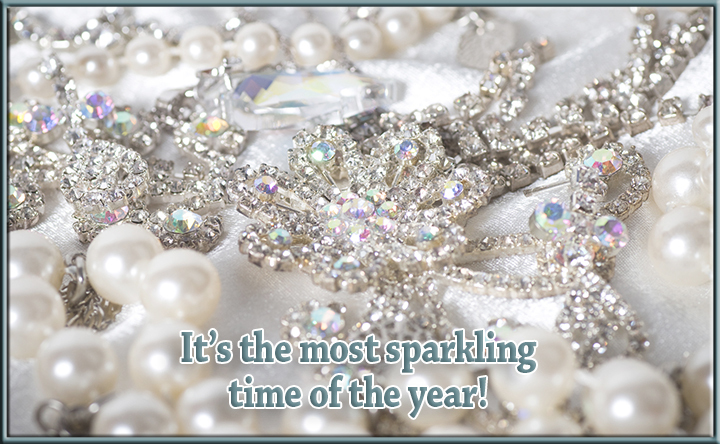 In fact according to a recent statistic by NRF, 24.8% of us would LOVE to receive jewelry as a gift this time of year. If the piece you are purchasing (or have received) is of considerable value, you may want to think about taking steps to ensure it is protected from theft, damage or neglect. Is your Current Coverage Adequate? While there is no one answer that is true for everyone, you should know that the standard homeowner’s policy offers Very Limited coverage for jewelry and the coverage it does provide is subject to a deductible. If you have jewelry or special pieces with substantial value, we urge you to purchase Valuable Items coverage. If you are not familiar with that type of coverage, please give us a call. We would be happy to speak with you. Advocate Brokerage would like to wish you and your family a wonderful holiday season filled with celebrations & joy!